Giant Pumpkins- the World's Biggest Fruit! Ah, fall weighoffs. What a great time of year. 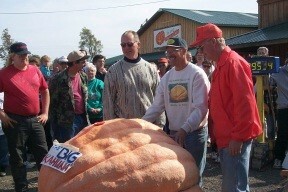 If you are a giant pumpkin grower, you'll certainly be there. If you are a pumpkin lover, 'ya gotta go just to see 'em. As always, we carry all of the results that we receive, as quickly as we get them. Often, we don't get the results, or they do not come in on a timely basis. In this area, we need your help. If you know the results of a particular site, please send them in. What is the most popular giant pumpkin seeds? It's the Dill Atlantic Giant, developed by Howard Dill. Growing Giant Pumpkins is fun, it's work, it's camaraderie and it's rewarding. If you are an avid gardener, you will likely be drawn to it as some point. So, why wait? Grow them this next gardening season!?! In the meantime, learn all you can about growing giant pumpkins here on Pumpkin Nook and other other websites about them! Are you ready to start? Sure you are!! It starts with pumpkin genetics. We recommend Dill's Atlantic Giant pumpkin seeds. Feature Grower Check out what others are doing..Will you be the next feature grower? Master Pumpkin Sculptors - Don't miss these really neat carvings. Every pumpkin grower feels the urge to grow these huge pumpkins at least once in their lives. Those who try, often are hooked for life. The challenge is huge. The rewards are enormous.